The music here is very pleasant and soothing to listen to. The first four tracks makes it seem like you are floating through clouds and reminds me very much of the early Isao Tomita albums. It has the same type synthesized sounds and tone. Track 5 departs from the overall tone of the CD by being a guitar backed male vocal track. As the song progresses more instruments are added and it becomes more orchestral. It sounds like a great ballad but unfortunately it's sung in Japanese so I don't know what he is singing about. After the vocal track the CD becomes much more orchestral and loses the Tomita feel. It reminds me of the sweeping sounds heard in the 90's Mothra movies when the little girls are flying around. You also get some great sounding action oriented tracks. Track 7 is a bass and drum heavy vocal sung by a female that is also ballad sounding. Track 12 sounds like a male vocal of the main title because I can make out the words "Sayonara Jupiter" in the singing. Track 18 is another very fine, pop sounding female vocal. I found this CD to be a very great listening experience with several different styles that actually mesh well although you would think they wouldn't. If you or I ever run across an original copy of this CD, grab it fast. You won't regret it. This CD is impossibly rare these days, not only because of its age (it is apparently the first Toho sci-fi soundtrack to appear on CD), but also because it features two songs by a popular Japanese singer-songwriter named Yumi Matsutouya, aka "Yuming". These tracks are unavailable elsewhere, so "Jupiter" is highly sought after by Yuming fans as well as soundtrack collectors. A vinyl LP edition of "Jupiter” was released around the same time as the CD, and is likely to be just as hard to find. The only other appearance of "Jupiter" music that I am aware of is a suite of cues on Disc 3 of the "King of Monsters" boxed set, released in 1994. 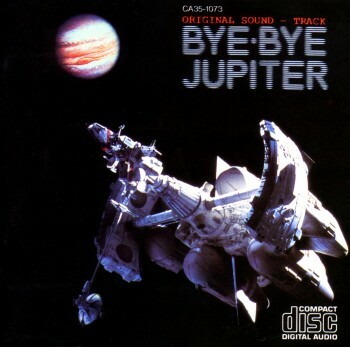 None of the cues on that set are duplicated on the "Bye-Bye Jupiter" disc, and other parts of the score have yet to see the light of day, so a release of the complete soundtrack from this film is long overdue.